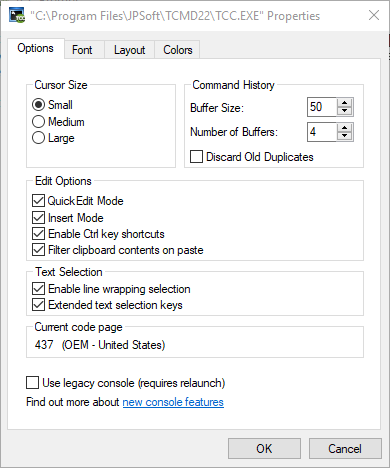 Windows 10 includes a number of improvements to Windows console sessions, including some additional control key shortcuts and text selection keys. Unfortunately these conflict with the (much more extensive) Take Command and TCC command line editing keys. And the default Windows behavior is to intercept those keys before TCC ever sees them. Fortunately, Windows 10 provides a way to pass those keys on to TCC. Uncheck the “Enable Ctrl key shortcuts” and “Extended text selection keys” options and click OK. Your TCC command line editing will now work as expected. You will need to add this directive in the [TakeCommand] section of TCMD.INI if you’re running Take Command stand-alone, or in the [4NT] section if you’re running TCC stand-alone (i.e. in a Windows console). Note that due to as-yet-noexistent Windows APIs, Take Command does not support the 256 color or 24-bit color options available in the Windows 10 Linux Subsystem.